Aalayah Eastmond opens up about her experience during the attack and how it has inspired her to lobby for greater gun control. 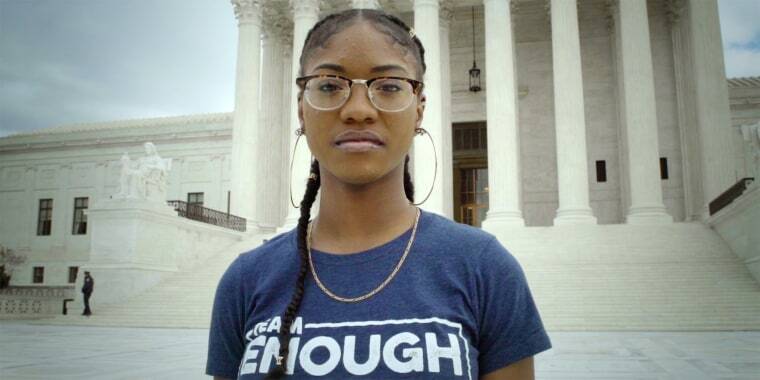 Parkland shooting survivor Aalayah Eastmond opened up to TODAY about her chilling experience during the attack and the activism work she's doing to lobby for greater gun control. She was sure it was a senior prank. A fire drill, maybe. A paintball gun. Those were the thoughts running through Aalayah Eastmond's head a year ago when a gunman walked into a hallway of Marjory Stoneman Douglas High School in Parkland, Florida, and started shooting. "It sounded like extremely loud pops ... we all paused and it was immediate eye contact with everybody in the classroom. And we just froze. And then we heard it again," Eastmond, 17, told TODAY. The classroom erupted into disarray — students ran to different corners of the room, unlike what was practiced in previous active shooter drills. Eastmond found herself sitting facing the classroom window behind 15-year-old Nicholas Dworet, a gifted swimmer who had eyes on the 2020 Olympics in Tokyo. Life as they both knew it changed in an instant when accused gunman Nikolas Cruz fired through the glass. The floor, now red. A classmate slumped slowly over the wall. It was real. Dworet fell next. Instinctively, Eastmond said she collapsed as he did, hiding under his body for protection against the shooter. "It's all about listening. I think we could definitely stop school shootings. I think school shootings might be one of the first things in gun violence prevention that we can stop. Because it's not hard to avoid." "I remember telling myself that's what I would do in that situation, because I have to look like I'm dead ... And at that point, I was just talking to God because I knew I was gonna die." After about 25 seconds, Cruz began shooting into another classroom and Eastmond stood up in shock. She was still in sight of the window, so classmates pulled her behind a filing cabinet for protection. They sat anxiously among the bodies of those who had been shot. Some began calling loved ones to say goodbye. "I called my mom ... I remember calling her and saying how much I love her and I'm sorry for all the bad things I've done ... After that, the call dropped and I called my father and I said the same things. And I told him tell my brothers I love them. Tell everybody that I love them. And the call dropped." Eastmond went through the motions just as she had rehearsed. "Since my sophomore year at Douglas, I planned out what I would do in every class I was in. Shootings are just something that happen on the regular. If you had gone to Douglas, you wouldn't be surprised that it happened there. We'd always say, it's not a matter of if it would happen here, it's a matter of when." In all, 17 people — 14 students and three staff members — were killed, and 17 others were injured in the 6-minute attack. It was Valentine's Day. Cruz, 20, has confessed to the killings. Today, he is locked away in jail in Fort Lauderdale, facing 17 counts of murder and 17 counts of attempted murder. If convicted, he could be executed. In the months since, Eastmond has had a lot quiet and lonely days, but also many that give her hope. She now channels her energy toward activism, focusing on conversations about gun control in black and brown communities. "My mission is for everyone to listen to the voices of color. And not just voices of color, but voices of the LGBTQ+ community, voices that go through domestic violence. A lot of people think shootings are just about mass shootings. They don't realize those numbers in communities of color reach mass shootings numbers in a weekend." Eastmond regularly participates in speaking engagements to spread awareness — she's spoken at the March For Our Lives Rally, testified at the confirmation hearing for Supreme Court Justice Brett Kavanaugh, and is becoming a regular presence at Capitol Hill in Washington. "I think a perfect world would be a world with no hate because that is the root of all evil. We wouldn't have this problem of gun violence if we didn't have hate," she said. "I just wish everybody would accept each other for who they are and embrace somebody when they're going through something and try to help each other rather than knock each other down. I think that would be a perfect world."